I didn’t get on the water today (my current PMY column alluding to house projects undone is true, worse than implied actually), but I did find a spot down the street that has a decent sky view to the Southwest where the new, and possibly troublesome, WAAS satellite #51 lives. Which is why—if any neighbors are reading—my truck was parked there with three chart plotters running on the cab roof for a few hours. It can take a while for a GPS to find and download WAAS corrections, which probably explains why I failed to see WAAS differential corrections on the Garmin 4212 last Thursday. Garmin assures me that, “As for the new WAAS satellites, all of our newer receivers include firmware that will recognize these new satellites. It might take a few minutes to discover the new PRNs, but they will be picked up eventually.” And the picture above, bigger here, proves it. There’s #51 and all satellites in use are being Differentially corrected. I haven’t heard back from Raymarine, but a commenter on the SSCA board reports being told that an update is planned once the satellite changes are complete. The A60/RS12 above, at the same time and place as the Garmin, did not seem to see or use #51, also known as PRN 135 (the PRN standing for, get this, Pseudo Random Number). Meanwhile, a relatively new Northstar M121 I’ve been meaning to spend more time with seemed to find #51 fine, and, though the color supposedly means “not in use”, it was reporting a DGPS fix (below). And on Friday, that fairly old Magellan Meridian at right was indicating a couple of WAAS corrections (the little red ‘W’s). In other words, there’s no telling whether your particular WAAS GPS will get the corrections now or not, plus we’re learning here that every manufacturer seems to have a different way of indicating WAAS on a GPS status page! But, again, I doubt that many mariners have a critical need for WAAS accuracy. Check all the satellites the Ray A60 is using—and, mind you, it did not have a wide open sky view—and notice that it thinks its HDOP accuracy is a very good 1.7, while the Northstar is only claiming 5.5 with differential fix in the same place an hour or so later. (HDOP = Horizontal Dilution of Position, another beaut of an acronym.) And the Garmin 545 with 6 WAAS corrected satellites only guesses itself a couple feet more precise than the 4212 with 10 uncorrected satellites. I’d sure want to get any WAAS GPS I had on a boat (or in a car) working right with the new satellites, but I wouldn’t freak about not having it for a while. PS Heck of deal over at PlastimoUSA’s surplus sale: discontinued Navman Tracker 5110i & 5110 (external antenna) greyscale plotters for $175. Previous story Digital chart art? Come to Rockland! BTW, a side note on what you might see from all these different receivers: the WAAS satellites transmit the corrections AND a “regular GPS signal.” Right now, the new satellites are still being dialed in on their “regular GPS signal” (aka ranging signal) so the error is listed as relatively high. Specifically, today its +/- 175m and +/- 50m, where-as a normal GPS satellite with WAAS corrections is +/- 3m. Anyway, the result is that some chipsets might show the WAAS satellites’ signals as an “empty bar” even though they also show differential mode. It just means they aren’t using the ranging signal from the WAAS satellites. WHAT FOLLOWS IS AN EXCHANGE BETWEEN FURUNO AND ME. NB: THE NEW WEST COAST WAAS SATELLITE IS #135. Thank you for contacting Furuno USA, Inc.
On the GP37 we can set it to manually look at the new WAAS satellite. To do this, please refer to the WAAS setup in the attached document and set the “WAAS SEARCH” to “manual 138”. On your chartplotter do the same setting for the WAAS setup. Manual and 138. Thanks again for contacting Furuno USA, Inc. We hope we have been able to answer your question. Please feel free to contact us with further questions in the future. Received word today from Raymarine about my waas issue with the raystar 125 and my e-series combination. They are offering a solution (copied below), via a software upgrade to their multifunction chartplotters. I am confused. 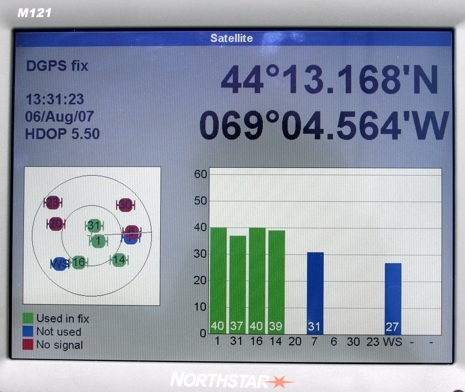 I thought the raystar 125 is a self contained unit capable of looking for sat’s, making gps calculations, listening for waas, and incorporating the result in either a nmea0183 or seatalk output without any dependency on a chartplotter. 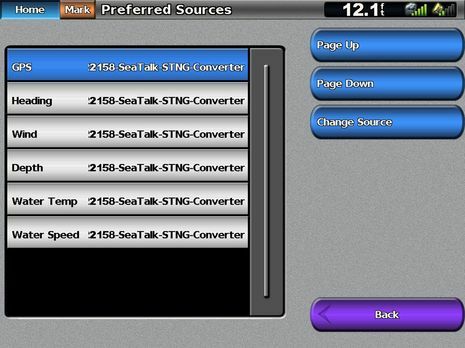 If that’s correct, that must mean that there are seatalk and/or nmea 0183 commands available to program the raystar 125. If I could get my hands on those commands, maybe I can program the raystar 125 from my pc ? I will ask. In late July, the FAA decommissioned the 122 and 134 WAAS GPS satellites and commissioned a new pair of WAAS GPS satellites, 135 and 138 respectively. 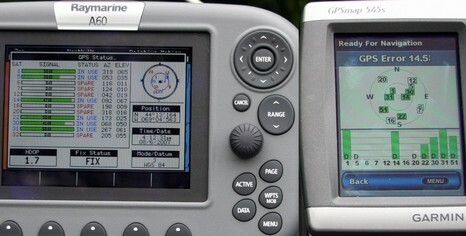 Presently, Raymarine’s Multifunction Displays (http://www.raymarine.com/raymarine/Default.asp?site=1&Section=2&Page=1034&Parent=2) will not track these newly commissioned WAAS GPS satellites. 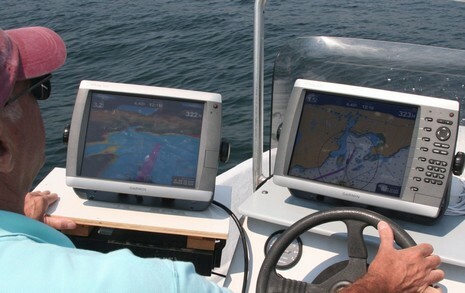 Raymarine will be releasing Multifunction Display software updates later this year to enable the Multifunction Displays to track these newly commissioned WAAS GPS satellites. When released, customers will be able to update the software in their Multifunction Displays. For more information concerning the Multifunction Display software update procedure, click on the following URL: http://raymarine.custhelp.com/cgi-bin/raymarine.cfg/php/enduser/std_adp.php?p_faqid=1219. Following the release of these software updates, Multifunction Display customers not having the PC hardware or Internet access required to perform download these software updates from Raymarine’s website and populate a SanDisk Standard Grade CF memory card (http://www.sandisk.com/Products/Item(1074)-SDCFB-256-SanDisk_Standard_CompactFlash_Card_256MB.aspx) may contact Raymarine’s Parts Line (800.539.5539 x8865) to order part E06058 CF memory card, specifying that it be populated with the latest software for their E-Series or C-Series Multifunction Display. “Later this year” means no differential GPS for thousands of customers for the balance of the summer. Raymarine should have anticipated this problem and had a fix ready. This is a grossly negligent oversight and may even put some boaters at risk. 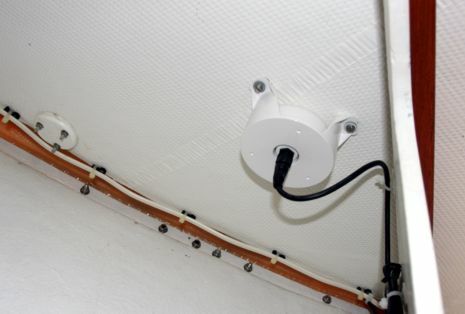 I’m very disappointed with Raymarine and so are many of your customers if the newsgroups are any indication. Q: I have recently updated the software in my C-Series display to v4.25. When loading waypoints and routes from an archive.fsh file that was developed with C-Series v3.18 software some routes overwrite other routes, even though they have different route names. This did not happen with the C-Series v3.18 software. A: Raymarine has identified a feature with the C-Series v4.25 software in which the waypoint / route / track database within the C-Series display may become corrupted when inporting waypoints, routes, or tracks from the archive.fsh file saved on a CF memory card. This feature may occur when the archive.fsh file contains waypoint, route, track, or group names beginning with a number. 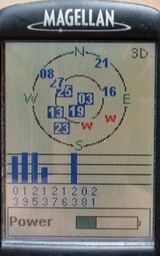 Raymarine will be addressing this feature in a future C-Series software release. Customers may work around this feature by using RayTech Planner / RNS 6.0 to rename waypoints, routes, or group names such that the first character of these names is a letter. Regarding updated software to address this issue, Raymarine is currently planning to release C-Series software to address this issue. A date has not yet been specified for the release of this software.